The Nigerian military said Wednesday that it has arrested eight of the suspected insurgents who launched deadly attacks since the weekend in the northeast in which more than a dozen students were killed. 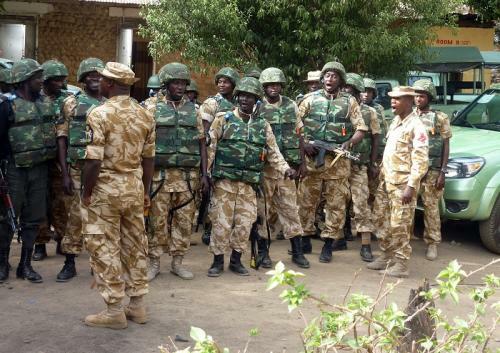 “Eight of the terrorists who perpetrated the mayhem during the weekend have been apprehended at the outskirt of Maiduguri,” the spokesman of the defence headquarters, Brigadier General Chris Olukolade, said in a statement. The insurgents attacked two schools in the northeast this week, leaving at least 16 students and two teachers dead. On Sunday, suspected Boko Haram gunmen opened fire on a secondary school in Damaturu in Yobe state, killing seven students and two teachers. On Monday in Maiduguri, the capital of Borno state, suspected Islamists shot dead nine students as they sat an exam in a private school. Two of the attackers were also killed, the army said. Boko Haram, whose name roughly translates as “Western education is sin,” has carried out multiple attacks on schools in northeast Nigeria. The statement said the insurgents’ recent attack “on soft targets” was a way of seeking attention and acts of desperation. It said that special forces have boosted mop up, cordon and search operations to ensure an end to the insurgency in those affected states. The military earlier Wednesday banned the use of satellite phones in much of the restive region after cutting mobile phone service, further isolating the area. The military claimed that the sect had used satellite phones to plan attacks on schools. It was unclear whether the ban would also apply to journalists, who have used satellite phones to communicate when visiting the region, where the military launched a sweeping offensive on May 15. Violence linked to the insurgency has left some 3,600 people dead since 2009, including killings by the security forces, who have been accused of major abuses.